Umbrella body of license clearing agents, the Association of Nigerian Licensed Customs Agents (ANLCA) has threatened to withdraw services of members from the ports nationwide in other to compel the federal government to the recurring vehicular traffic jam at Apapa. The National Publicity Secretary (NPS) of the association, Dr. Kayode Farinto who disclosed this in a press briefing in Lagos stated that the association viewed the traffic problem experienced daily at Apapa as totally unacceptable to it. 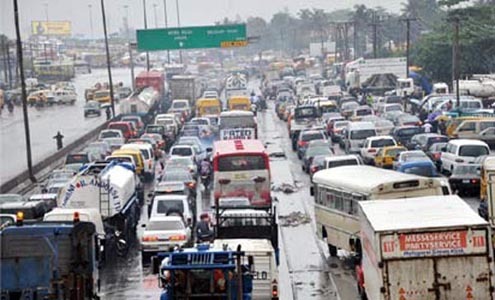 According to him,” It has come to the notice of the President and members of the Association of Nigeria Licensed Customs Agents (ANLCA) that the traffic gridlock along Oshodi-Apapa Expressway, Wharf Road, Marine Bridge, Ijora, Orile and so on is now unbearable. “All of the above mentioned entry routes into Apapa have become dens for armed robbers and hideouts for them to perpetuate their evil acts. Some stakeholders have at various times been dispossessed of their valuables and cash at gun points on a daily basis. “Customs brokers, Customs officers, freight forwarders, various port users including residents of Apapa have continued to experience untold hardships. This has been having negative impact on business activities within and outside the port environment. Some innocent Nigerians have also on many occasions, fallen victims to armed robbery attacks in their bid to make use of few alternative routes,” the statement read. While recalling that all efforts by ANLCA and some patriotic Nigerians to control the situation have failed, he pointed out that the association some years back, having envisaged that port users would face the challenges they were facing now advised the government against citing tank farms within the port areas especially along the port access road, from Ijora to Apapa wharf up to Tincan Island and towards Mile 2. “But all our suggestions were ignored by the then federal government under the administration of former President Olusegun Obasanjo who went ahead to give approval to all tank farms to be situated around Nigeria’s busiest ports. This greedy, singular and callous act of ‘Executive Recklessness’ has brought economic loss in terms of manpower and loss of valuable time to both the rich and the poor. “The federal government is not exempt in these daily records of losses as revenues generated by some government agencies have begun to drop at an estimate of over N5, 000, 000, 000 (five billion naira) daily. This is as a result of the traffic gridlock”, he said. While emphasizing that the President Goodluck Jonathan’s led administration had paid less attention to the Apapa gridlock which left the surface layer of the road in a very bad condition with pot holes, he however called on the incoming administration of Gen. Muhammadu Buhari (rtd) to find a long lasting solution to the gridlock. He maintained that, “ It will be recalled that during the electioneering campaign, the Vice president-elect, Professor Yemi Osinbajo promised to look into the Apapa traffic matter and explained that the new administration will relocate the tank farms in and around the port environment to somewhere around Lekki-Epe Expressway. “We urge his Excellency to expedite actions on this as soon as his government is being sworn into office. Moreso, we call on the new Managing Director, Nigerian Ports Authority (NPA), Mallam Sanusi Lamido Ado Bayero to partner with other stakeholders like the Nigerian Navy in order to give temporary solutions which will serve as palliative measures to the traffic gridlock and will alleviate the sufferings of the maritime stakeholders. “Finally, if nothing is done, we may have no other option than to withdraw our services from the ports in order to compel the federal government to live up to her constitutional responsibilities to the citizens”.